Why Reading to Your Baby is So Important - Benefits Explained! Given the number of experts who recommend family reading time, you have probably heard that reading to your baby is important. However, you may find yourself wondering if it’s even worthwhile to read when your baby seems too young to engage with a book, or you may be a little puzzled by how to begin a reading routine. The truth is that reading together can have several benefits for your whole family, and story time doesn’t have to be an academic exercise. Here is some information that can help you understand the science behind reading aloud and how you can start a reading routine for your family. Being read to can actually change your child’s brain. New studies have revealed just how much your baby can benefit from reading aloud starting at a very young age. All children are born with the full number of brain cells, or neurons, that they will have for the rest of their lives. Most people typically have somewhere around 100 billion neurons. While this number of neurons is already set, you as a caregiver have the ability to influence how these cells develop connections and learn to relate to each other. These individual cellular connections are called synapses. Chains of synapses form neural pathways, and these pathways determine how your baby’s brain will process thoughts and respond to life. A child’s brain development from birth to about age three is nothing short of astounding. While every child comes hardwired with their own unique personality from birth, a newborn’s brain is largely a blank slate that is eager to learn about their new world. In fact, children learn so much during their first years of life that the typical two-year-old brain contains higher numbers of synapses than most adult brains. 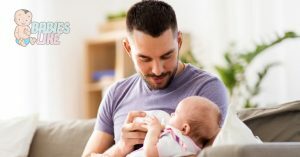 The process of listening to a story and looking at the pictures can encourage your baby’s brain to establish synapses and neural pathways that can help them develop thinking, speech and early literacy skills. Reading can also help train the brain to work at a faster speed and better handle the information given to it. By holding your child close and reading together, you are introducing words, visuals and touch to a brain that is eager to learn. Words. Listening to the sound of your voice as you read helps your child understand that sound comes from your mouth and that different lip positions produce various sounds. Children learn to talk by hearing other people speak and then mimicking the sounds they hear. Reading can be helpful to this process by exposing your child to a variety of vocal patterns. For instance, the way you use different tones to convey a question or a statement provides your child with an example they can imitate. Visuals. When you point out and name objects or characters shown in the book, you introduce the concept that words and things are closely connected. Understanding that words convey meanings is a foundational skill in the process of your child learning to read for themselves. Reading can also stimulate the parts of your baby’s brain that control thinking as they work to process and make sense of the images they see. Touch. Physical closeness has a profound effect on a young child’s senses of security and well-being. The need to feel secure is deeply rooted in children, and loving touch is a primary way for them to feel a sense of safety. When this basic need is met, the brain can more easily focus on higher tasks like learning and engaging in the world around them. As great as the brain-boosting aspects of reading can be, the benefits of daily story time don’t stop there. Reading together teaches your baby that books can be fun and exciting. Since each child has their own unique personality, some children have a natural interest in reading while others may find it less appealing. Although you can’t control your child’s preferences, you can help shape them. Introducing your child to books early on and making the process fun can make a significant impact on how they think about reading as they grow older. Think of yourself as the person who has the primary influence on your child’s view of reading, and make it your goal to help your child enjoy it to their fullest potential. Encourages you to be fully present with your child. Modern life is often so busy and full of distractions. It can be all too easy to reach for your phone or check your email while your baby sits on the floor playing. Picking up a book, reading the words and turning each page child forces you to focus on your baby and the task at hand. Establishing a regular reading time can help you create a daily routine. Children often thrive on simple routines. Having quiet reading times built into your daily schedule could function as a signal that it’s time for your child to wind down and relax before their nap or bedtime. Provides sweet memories for you and your child. Any time you spend reading to your child is likely to be time that you will never regret. You can always cherish the memory of snuggling your baby and enjoying a book together. One more thing to keep in mind: Don’t let the habit of reading with your child fall by the wayside as they grow older. Preschoolers still typically enjoy sitting in your lap for a book, kindergartners can sit beside you to hear a longer story and school-age children often look forward to hearing a daily instalment from chapter books. Time spent reading as a family can yield wonderful memories for all involved. When Can You Start Reading to Infants? It is never too early to start reading to your baby. You may feel a little silly reading a book to your sleepy newborn, but remember that the sound of your voice is one of the most soothing noises your baby can hear. Even though they may be too young to actually follow a story, your baby can still enjoy being held close and having your undivided attention. Storytime will become a more interactive experience as your child grows, with lots of flap-lifting, page-turning and pointing to colors or simple objects. Babies who are about six months and older are typically more interested and engaged in reading time, and this is the age when some of the learning benefits outlined above really begin to kick in. Now that you know why reading to your baby is so important, here are some ideas for features to look for when you’re shopping for books and how to make the most of your reading time. Bright, high-contrast colors. This is especially true for very young babies. Your baby sees mostly in black, white and gray up to the age of about four months, so high-contrast patterns are easier for them to see. Hold the book about a foot away from your newborn to give them the best view. Repeating sounds and words. 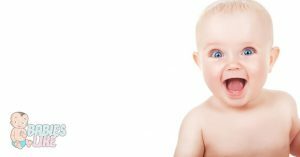 While an older child or adult may get tired of hearing the same line over and over, babies seem to relish every repetition with delight. Children’s books are intentionally written with rhythmic, repeating words. Repetition is actually an ideal way for your baby to learn speech patterns while rhyming words and a rhythmic flow can help them remain engaged with the book. If you find yourself getting a little bored with reading the same words several times, keep an eye on your baby’s face. If they are still interested and enjoying the book, let that be your inspiration to read it again with gusto. Photos and Illustrations. Young babies love to look at photos of human faces and seem to be especially drawn to the eyes. Older infants and toddlers often favor pictures of other babies, and they may even try to give hugs and kisses to the children in the pictures! Entertaining illustrations make a book more enjoyable for almost anyone, and babies are no exception. Look for bright colors, bold patterns and pictures that are large enough for your baby to see easily. Point to a character’s facial features, and then point to your baby’s corresponding features. Help your baby imitate any simple actions depicted in the book, like clapping. Based on the picture, add as many sound effects as you can. The sillier the better! Remember, your baby is highly unlikely to care if your noises aren’t exactly accurate. This can be especially fun when your baby gets old enough to add some sound effects of their own! Textured Surfaces. Touching and handling objects are great ways for your baby to learn about them. Feeling raised bumps, fabric or furry pieces, cutouts and liftable flaps all encourage your baby to engage and explore. It can be fun for both of you. It can help your child’s brain develop to its fullest potential. It can be a part of a predictable daily routine. In years to come, you can look back on how much you both enjoyed storytime. Take a look at our roundup of some of the best books for babies and toddlers that are currently available. Whether your child is a newborn, infant or toddler, there is no better time than today to start reading to your little one. Have you had any struggles or successes in reading to your baby? Let us know about your experiences in the comments!